The period at which this little Grebe makes its first appearance, after the breeding season, on the waters of the Western States, such as the Ohio, the Mississippi, and their numerous tributaries, is the beginning of October, when I have seen them arriving and passing onward on wing at a considerable height in the air, following the course of the streams. The generally received idea that birds of this genus perform their migrations on the water, is extremely absurd. I have already offered some remarks on this subject, but as too much cannot be said, when an erroneous notion extensively adopted has to be disproved, I here repeat that I have seen flocks of Grebes on wing and migrating high in the air, apparently with as much ease as many longer-winged birds, and with considerable velocity. Towards evening, on the 14th of October, 1820, I was floating in a small boat on the Ohio. The weather was perfectly calm, and I was startled by a whistling sound over head, resembling that of a Hawk stooping on its prey, when, on looking up, I saw a flock of Grebes, about thirty in number, gliding towards the water as if about to alight within a quarter of a mile from me. In a few minutes they had come within a few yards of the surface of the water, when suddenly checking their speed, they pursued their course until out of sight; but in a short time I saw them returning towards me, and in less than a minute they all passed at a distance of forty or fifty yards, took a round and alighted pell-mell. The next moment, they were all engaged in washing and trimming themselves, in the manner of Ducks, Cormorants, and other aquatic birds. As I rowed towards them, they scarcely took notice of me, so that they were easily approached; and finding a number of them close together, I fired and killed four. The rest paddled off for some yards, rose on wing, and flew down the stream in a pretty close body, looking as if not disposed to settle again for some time. On picking up the dead birds, I found them to be of the present species, three being young, the other an adult with the winter plumage beginning to appear. Here I may remark, that Grebes in general do not moult so early as most other birds after they have young; thus the Crested Grebe often passes to the south in September, with its head still adorned with a large portion of the feathers of its spring and summer tippet. While residing at different places on the Ohio, I have many times witnessed the passage of the Horned and the Crested. 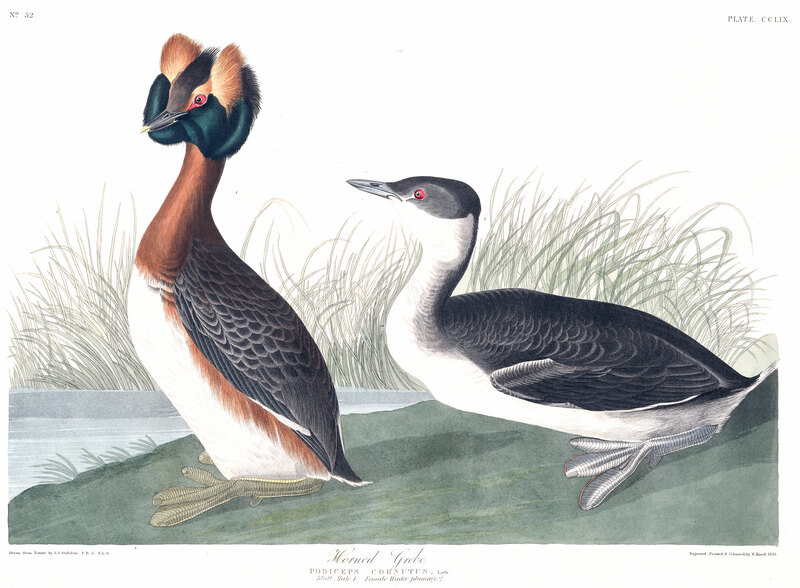 The Horned Grebe is abundant during autumn and winter on the large rivers or inlets of the Southern States, but rare along the coasts of the Middle and Eastern Districts. On the rivers about Charleston in South Carolina it is seen at those seasons in considerable numbers, although not in larger flocks than from four to seven individuals. The same is observable from that place to the mouths of the Mississippi. It is particularly fond of those streams of which the borders are overgrown by rank sedges and other plants, and are subject to the influx of the tide. In such places they enjoy greater security while searching for their food than in ponds, to which, however, they for the most part retire at the approach of the pairing season, which commences early in February. At that time one might be apt to think that these birds could scarcely fly, as they are then rarely seen on wing; but when they are pursued, and there happens to be a breeze, they rise from the water with considerable ease, and fly to a distance of several hundred yards. In December and January I have never procured any having the least remains of their summer head-dress; but by the 10th of March, when they were on their journey towards the north, the long feathers of the head were apparent. These tufts seem to attain their full development in the course of a fortnight or three weeks, the old birds becoming plumed sooner than the young, some of which leave the country in their winter dress. On the ground, this species is not better off than the Dobchick, it being obliged to stand nearly erect, the hind part of the body resting, and the tarsi and toes extended laterally. They dive with great celerity, and when once acquainted with the effects of the gun, are not easily shot. A report is at times sufficient to make the old birds dive at once, although they may be quite beyond the reach of a shot. The young birds are more easily procured at their first appearance; but the most efficient method of obtaining them is to employ fishing nets, in the meshes of which they become entangled. Excepting a species of Hawk nearly allied to Circus cyaneus, I know of no other bird that has the eye of such colour, the iris being externally of a vivid red, with an inner circle of white, which gives it a very singular appearance. On attentively examining the eyes of our Divers and Grebes, I have not found any with similar eyes. The Horned Grebe does not seem to see better than any other species, nor does it appear to be more diurnal than the rest, nor are the objects on which it feeds more minute, for I have found as small seeds in the stomach of the large Grebe as in that of the present species. The reason of this strange colouring of the iris, therefore, I am unable to conjecture. Although the greater number of these birds go far northward to breed, some remain within the limits of the United States during the whole year, rearing their young on the borders of ponds, particularly in the northern parts of the State of Ohio, in the vicinity of Lake Erie. Two nests which I found were placed at a distance of about four yards from the water's edge, on the top of broken down tussocks of rank weeds. The materials of which they were composed were of the same nature, and rudely interwoven to a height of upwards of seven inches. They were rather more than a foot in diameter at the base, the cavity only four inches across, shallow, but more neatly finished with finer plants, of which a quantity lay on the borders, and was probably used by the bird to cover the eggs when about to leave them. There were five eggs in one nest, seven in the other; all contained chicks (on the 29th of July); they measured one inch and three-quarters in length, by one inch and two and a half eighths; their shell was smooth, and of a uniform yellowish cream colour, without spots or marks of any kind. The nests were not more than fifty yards apart, on the south-western side of the pond. I am thus particular because of the near relation of this bird to the Podiceps auritus of LATHAM, with which it may be confounded by a not over-careful observer, as may the eggs too, those of the latter species being precisely of the same length, but fully an eighth of an inch narrower, which of course gives them a more elongated appearance. I have observed the same differences in the eggs of these two species in Europe. I could not ascertain if both the parent birds incubate; but as I saw two pairs on the pond, I am inclined to think that they do. The nests were not fastened to the weeds around them, nor do I conceive it probable that they could be floated, as various writers assert they are at times. I have not seen the young of this species when small; but from the knowledge I have of those of other Grebes, I feel pretty certain that the notions entertained of their being carried either on the back or under the wings of their parents in cases of danger must be erroneous, as Grebes in all such cases dive or fly at once, when it would be impossible for the old and young to keep thus attached to each other. I have observed in the stomachs of almost all that I have examined, a quantity of hair-like substances rolled together like the pellets of Owls, but have not ascertained whether or not these masses are disgorged. They certainly cannot pass through the intestines. But unless birds of this kind are kept in an aviary and watched, this matter must remain unknown. The food of this species, while on salt-water, is composed of shrimps, small fishes, and minute crustacea. While on fresh-water, they procure insects, leeches, small frogs, tadpoles, and aquatic lizards; they also pick up the seeds of grasses, and I have found as many in the stomach of an individual as would fill the shell of one of its eggs. Their flight is performed by regular short flappings, executed with great quickness. I have represented an adult male in full spring plumage, and a young bird shot in December. The males are rather larger than the females, which are similar in colour, but rarely have the head so well feathered during the breeding season. PODICEPS CORNUTUS, Bonap. Syn., p. 417. PODICEPS CORNUTUS, Horned Grebe, Swains. and Rich. F. Bor. Amer.,vol. ii. p. 411. HORNED GREBE, or DOBCHICK, Nutt. Man., vol. ii. p. 254. HORNED GREBE, Podiceps cornutus, Aud. Orn. Biog., vol. iii. p. 429;vol. v. p. 623. Male, 14 3/4, 25 1/2. Very common during autumn on the Ohio, Missouri, Mississippi, and all their tributaries, as well as in all the Atlantic Districts, to Texas. Breeds from the Great Lakes to the Fur Countries. Migratory. Bill shorter than the head, straight, acute, rather slender. Upper mandible with the dorsal line straight for one-half of its length, towards the end declinate and slightly convex, the ridge convex, the sides sloping, the edges sharp and inflected, the tip acute. Nasal groove broad, extending to beyond the middle of the mandible; nostrils sub-basal, linear-elliptical, pervious. Lower mandible with the angle long and very narrow, the dorsal line short, ascending, straight, the sides erect, slightly convex, the edges sharp, inflected, the tip narrow, acute. Head of moderate size, oblong, compressed. Neck rather long and slender. Body depressed. Feet large, short, placed far behind; tibia feathered to the joint; tarsus short, extremely compressed, anteriorly with a narrow scutellate ridge, laterally with numerous broad scutella, posteriorly with a narrow ridge having a double row of small prominent scales. Hind toe very small, with an inferior small membrane; fore toes long, the outer modest, scutellate above, united at the base by short webs, externally margined, internally with broad rounded expansions, which are marked with parallel oblique lines, and crenate on the edges. Claws flattened, that of the middle toe broadest, with an extremely thin, broad terminal edge. Plumage of the head and neck very soft and downy, of the breast and sides silky and highly glossed, of the abdomen downy, of the upper parts imbricated, but with loose edges. Wings small; primaries much curved, the first longest, the second almost equal. Tail, a small tuft of loose feathers. On the head, at this season, is a tuft of soft feathers on each side behind the eye, and a larger on each side of the upper part of the neck. Bill bluish-black, its tip yellow. Short loral space bright carmine, as is the iris, its inner margin white; edges of eyelids greyish-blue. Feet dusky externally, internally and on the anterior and posterior ridges of the tarsus dull yellow; claws dusky. Forehead greyish-brown; upper parts of the head bluish-black, as are the sides, fore neck anteriorly, and the elongated ruff feathers; a broad band over the eyes, and the elongated tufts behind them yellowish-brown. Fore neck brownish-red; lower parts white, the sides reddish-brown; abdomen dull grey. The upper parts are brownish-black, the feathers edged with greyish, the middle secondary quills white. Length to end of tail 14 3/4, to end of claws 19; extent of wings 25 1/2; wing from flexure 5 3/4; bill along the back 11/12, along the edge of lower mandible 1 1/4; tarsus 1 1/4; outer toe 1 10/12, its claw 3/12. Weight 14 oz. The feathers of the hind head are a little elongated, but at this age there are no tufts on the head. In other respects the plumage is as in the adult male. The bill is bluish-grey, as is the bare loral space; the eye bright carmine, the iris with an inner white edge; the feet bluish-grey. The upper part of the head, and the hind neck, are greyish-black, as are the upper parts in general. The feathers of the back edged with light grey. The throat, the sides of the head, a broad patch on each side of the neck nearly meeting behind, and the breast white; the sides and downy feathers of the abdomen brownish-grey. Some of the secondaries are white, as in the adult male. Male. The mouth as in the last species, 4 1/2 twelfths wide; the tongue 11 twelfths long, and similar to that of the Red-necked Grebe. OEsophagus 7 inches in length, along the neck only 4 twelfths broad; the proventriculus excessively large, ovate, 10 twelfths in breadth. The stomach is an enormous sac, 2 inches long, 1 1/2 broad, a little compressed, of the same structure as in the last species; its tendons 4 twelfths in breadth. There is a small flattened pyloric lobe. The contents of the stomach are feathers, and bones of fishes. There is in this species a very distinct, thick, soft, bright red, longitudinally rugous epithelium. The proventricular glands are of great size, the largest 3 twelfths long, 1 twelfth in breadth; they form a belt 1 1/4 inches in breadth. The lobes of the liver are very large, the left 2 inches 4 twelfths long, the right 2 inches; the gall-bladder oblong. The intestine forming 12 curves; its length is 49 inches, its breadth at the upper part 5 twelfths, diminishing to 3 twelfths; the coeca 2 inches long; their greatest width 2 twelfths, their distance from the extremity 1 inch 9 twelfths. Cloaca globular, about 7 twelfths in width. The trachea is 6 1/4 inches long, much flattened in its whole length, excepting half an inch at the lower part; for half its length it is 2 twelfths in breadth, then enlarges to 3 twelfths, and finally diminishes to 1 1/2 twelfths. The rings are 184, firm. The bronchi are slender, with the rings complete, ossified, 12 in number: the remaining part being membranous. The muscles as in the last. The jugular veins are not enlarged in this species.